So far I’ve used three digital modes on the HF bands: PSK (mostly PSK31), WSPR, and JT65A. PSK is fun, in that you see signal phenomena in real time, and you see them both visually and in the ability or inability to decode the signal. If the signal fades, you see it fade; if two stations transmit on the same frequency, you can see that too. It allows you to chat with other stations and write whatever you want. But because PSK31 does not have any error correction or automatic acknowledgements, you sometimes receive only part of a transmission. To me, this feels low-tech. I expect digital transmissions to be almost perfect when communication is possible. PSK31 is not. WSPR and JT65A incorporate strong error correcting codes, so transmissions are usually error free (not always, but almost). But neither of these is good at actually sending information. In WSPR the only information transmitted is station identification and location; you can’t say anything other than who and where you are. JT65A allows you to send a bit of free text, but it’s cumbersome; mostly, it’s also just for establishing the ability to communicate, not for actually communicating information. Yesterday I finally succeeded in using another digital mode called WINMOR, which really feels like high-tech on HF. WINMOR is part of Winlink 2000, a system that is mostly designed to send and receive regular internet email through HF, VHF, and UHF radios. It is used by radio amateurs, emergency organizations, and NGOs to communicate by email from places that do not have internet connections (like yachts, jungles, etc.). Winlink initially used an HF digital mode called PACTOR, which is very adaptive and efficient. PACTOR requires a dedicated hardware modem; the protocol is proprietary and the modems are expensive. A couple years ago Rick Muething designed WINMOR, an HF sound-card protocol for Winlink 2000 (on VHF and UHF Winlink uses AX25). I downloaded the software a while back but didn’t manage to connect to an HF radio gateway, and forgot about it. Yesterday I decided to give it another try. The software uses a propagation prediction program and a list of active gateways to suggest gateways that are likely reachable. I tried to connect to the one that was supposed to be best, in southern Russia (on 14MHz). I heard the gateway respond and got a message that I was connected, but when the software tried to deliver an email message I sent, the gateway failed to respond and the connection was broken. I tried a few times and gave up. I also tried gateways in the Netherlands and Germany, but they did not even respond to me. In the afternoon conditions on 14MHz seemed to have improved, so I tried again. It worked! I received the mail I sent myself via HF! I replied and connected again to the radio gateway, and the response was delivered to me over the radio. Very cool. I was later able to also connect to the radio gateway in the Netherlands, and to upload position reports to Winlink 2000, not just email. The Winlink web site shows the position of all the stations that uploaded position reports recently, and you can also view all the recent positions of particular stations. It’s quite interesting; many stations upload position reports from the middle of the ocean, as you can see here. Winlink and WINMOR are really interesting. They deliver a useful service. Most of the time, sending email via WiFi, cellular, or wired networks makes much more sense than sending email over HF or VHF radios. 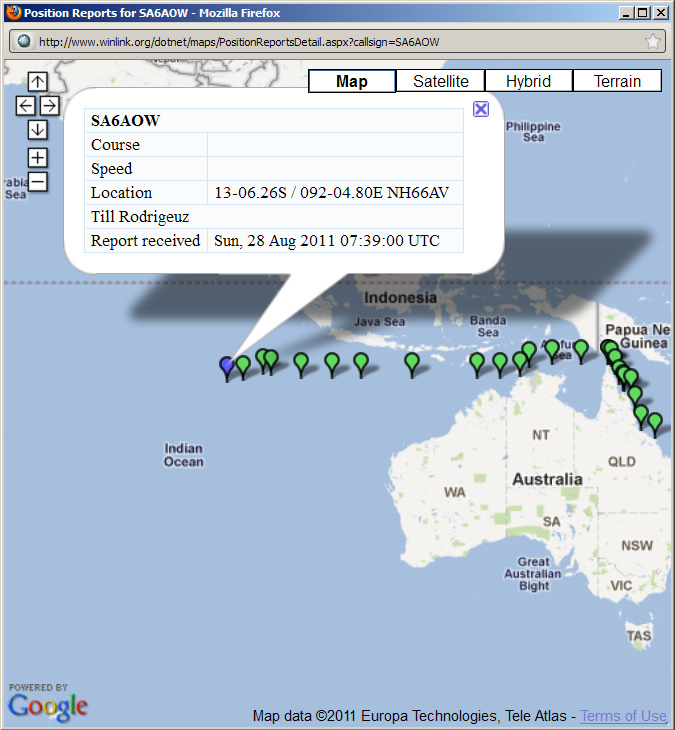 But in emergencies and when you’re in the middle of the ocean, Winlink is a really useful service. The protocol is very sophisticated, but you can sort of see some of what it is doing. You hear and see acknowledgements, retransmissions, and other protocol actions. But the biggest difference between WINMOR and many other HF digital modes is that it is an all-or-nothing protocol; it either delivers the data perfectly with no errors, or it fails completely. You don’t get garbled text. This is how modern communication works. It’s not easy to set up radio gateways; the Winlink 2000 folks want gateways to run continuously (24 hours a day, every day), so setting up a gateway is not something to just experiment with, like I did with WSPR and APRS. But WINMOR also has a peer-to-peer mode that allows you to communicate outside the Winlink system; perhaps I’ll try that. 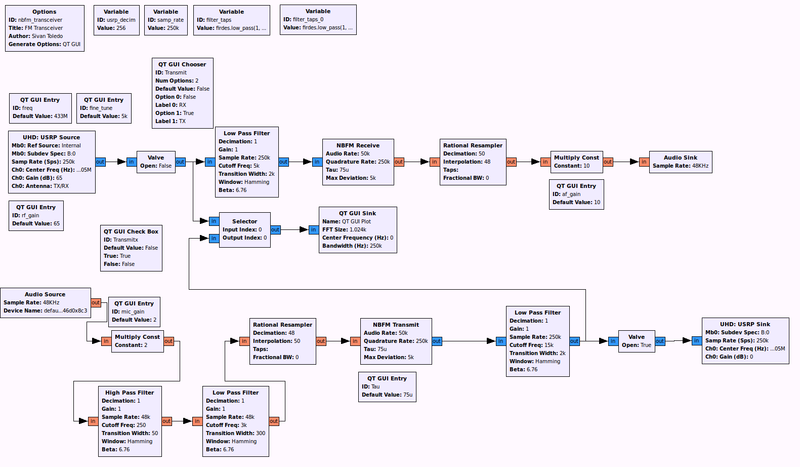 GNU Radio is a package of DSP building blocks for constructing software radios. It is also the support software for a range of radio front ends from Ettus Research. You can also use GNU Radio with other radio front ends; I was able to easily use it with a Softrock receiver. These radio front ends are a modular system containing motherboards and daughter boards. The motherboards have high speed ADCs, high speed DACs, and an FPGA for high-speed DSP. In most cases the FPGA does relatively little (but at high sample rates): decimation and digital down conversion on receive, and digital up conversion and interpolation on transmit. The rest of the signal processing is done in software on a PC (some motherboards have an embedded PC running Linux). The daughter boards typically contain transceivers or receivers that move the baseband signals produces or consumed by the motherboard to higher frequencies. I have the oldest motherboard, a USRP1, and a few daughter boards: BasicTX and BasicRX, which are just transformers that allow you to access the baseband signals directly, and an RFX400, which is an old transceiver for 400-500MHz. Newer transceiver boards cover much wider frequency ranges. Obviously, GNU Radio contains signal blocks that transfer samples to/from the hardware front ends (actually there are two versions of these blocks; I used the newer ones, called UHD). GNU Radio (the software) consists of three main parts. One is a library of signal processing blocks (filters, demodulators, etc) written in C++. The second part is Python wrappers for these blocks. The Python wrappers allow you to connect the DSP blocks into a signal flow graph in Python, which is easier than connecting them in C++. The third part is GNU Radio Companion (GRC), a graphical environment for constructing these signal flow graphs. It allows you to construct interesting and working radios visually, without writing a single line of code. Very cool. First, you need to install GNU Radio. The software has many dependencies, so installing it is definitely not easy. I installed it several times, on both Linux and Wiindows. Each time, some of the software worked but some did not. I don’t bore you with all the details. What worked best eventually was installing on Windows using Josh Blum’s detailed instructions. Even after I completed the install, GRC would not start; a dialog box suggested that I need to set two environment variables, PYTHONPATH and LD_LIBRARY_PATH. This turned out to be misleading, because on Windows you need to set PATH, not LD_LIBRARY_PATH. Once I figured this out and how to set the variables (by digging the sources to see what they were supposed to point to), GRC worked. There are some blocks (some important) that do not work or do not fully work under Windows: The WX GUI blocks (which many GNU Radio example codes use), and the audio source and sink. As far as I can tell, the audio source does not work at all. The audio sink does work, but you can’t specify an audio device (which is possible in Linux). Also, in the other set of GUI blocks, the Qt blocks (which Josh added to GNU Radio), the slider does not work, which is fairly annoying. On Ubuntu Linux, you can install GNU Radio and GRC from existing packages, but then the installation contains neither the UHD driver and blocks nor the Qt blocks. I tried to live with this, but the WX blocks did not work well, so I switched to an alternative installation method. In this method, you run a script that installs everything. The script worked well for me, installing a version with both UHD and Qt support. With the software installed, I started experimenting with GRC (I actually started by trying to run the Python examples that came with GNU Radio, but they did not work because of some problem with the WX GUI blocks, so I switched to GRC experiments). To get started, I mostly used the tutorials by Sharlene Katz and the GRC examples by Alexandru Csete. Sharlene’s examples use the old USRP driver, not UHD, and they use the WX GUI blocks, so I could not use them as it, but her tutorials were very helpful. Alexandru’s examples are available for both the old USRP driver and for UHD, so they were mostly usable as is. Here is a simple SSB/CW receiver that uses a Softrock as a front end. There is no tuning control (I controlled the center frequency of the Softrock from another application), but the receiver works and I was able to hear some CW signals on 14MHz. I think that writing a controller that would be able to tune the Softrock should not be that hard (since another Python program, Quisk, already knows how to do that). 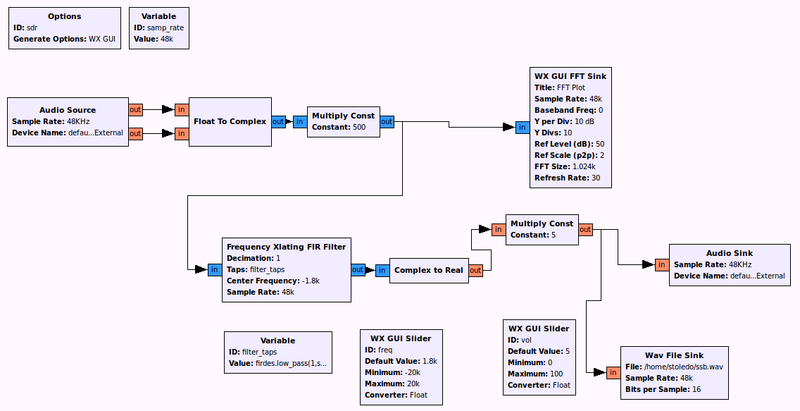 My second GRC radio is a bit more complex: a narrow-band FM transceiver. I use it with the RFX400 transceiver, connected to the 430-440MHz home built Yagi. I can hear many FM voice signals, some from quite a distance. I was also able to communicate with Avishay Ginzburg, who lives about 4km away. It’s not that far, but the RFX400 only puts out about 100mW. Avishay complained that my audio was pretty bad, but he was able to understand me. There is also some problem with switching from transmit back to receive which I still have to investigate. In theory, when the USRP has no outgoing samples to send, it switches off the transmitter in the daughter board, allowing the daughter board to receive from the same antenna connector. I stop the samples from going out during receive using a signal processing block called a valve. In practice, the transmitter sometimes stays on, preventing the receiver from functioning properly. I don’t know if it’s a bug in my GRC radio or a bug in the valve or on the UHD driver. Anyway, here is one version of this transceiver (I keep modifying it). My next plan is to see if I can hear satellites using this radio. I’m basically waiting for a satellite pass with a strong signal that I can easily hear using the FT-875D; once I hear one, I’ll switch the antenna to this software radio and see if I can see the signal on the spectrum display and hear the audio.